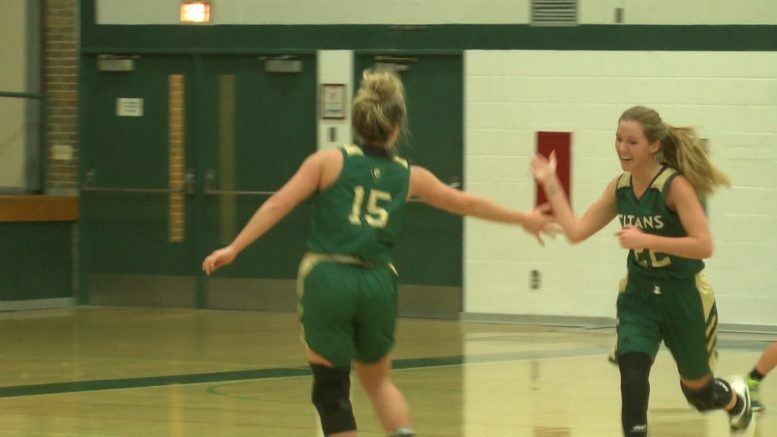 ALPENA, MI — The Alpena Wildcats hosted the Traverse City West Titans for the green and white’s third Big North Conference game of the season. Both Alpena and TC West looking for their third win of the season. The Wildcats started off hot taking an early 13-0 lead. Junior Jade Schultz scored the last 8 of those 13 points. The Titans answered with two back-to-back steals, both for layups and one for a foul to make it a 13-5 game. Alpena would end the first quarter 14-7. Schultz put up 10 points and 3 fouls after one. The second quarter was a different story. Too many fouls sent athletes to the charity strike. Then, TC West’s Tacey Looze knocked down a three-pointer to close the gap and tie it up at 25 going into halftime. The Titans’ Sierra Perkette knocked down a big three in the third helping West get the 44-35 lead entering the fourth quarter. Alpena needed a comeback and junior Abby Funk made a three-pointer to put the Wildcats within four 46-42. Moments later, Macy Dickinson captured the steal of the game and took it to the house, and Alpena was down 46-44. Missed shots and fouls gave the Titans the advantage, and Traverse City West won 50-44. Despite the loss, their are positives to take from this game. Alpena is (2-4) overall and (1-2) in the BNC. The Wildcats take the floor again on Friday, January 4, 2019 in Escanaba.